DLM DL Series Mechanical Edge of Dock Leveler 72&quot;W Usable & 108&quot;W Overall 20,000 Lb. Cap. DLM DL Series Mechanical Edge of Dock Leveler 72"W Usable & 108"W Overall 20,000 Lb. Cap. 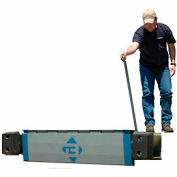 DLM DL Series Mechanical Edge of Dock Leveler 66"W Usable & 102"W Overall 20,000 Lb. Cap. DLM HED Series AC Powered Edge of Dock Leveler 66"W Usable & 104"W Overall 20,000 Lb. Cap. DLM HED Series AC Powered Edge of Dock Leveler 72"W Usable & 110"W Overall 20,000 Lb. Cap. Attaches easily to the steel nosing of an existing dock, saving valuable dock loading space; no concrete work or pit necessary. 5" upward and 5" downward working range. A full 15" lip projects 12" beyond bumper. High strength 3/8" steel safety plate and heavy-duty hinges. Automatically releases and returns to stored position when truck exits. Supplied with two 12" x 14" molded rubber bumpers and reinforced mounting blocks. Counter-balanced extension spring lift ensures one person, one hand operation. Includes 41"L Steel Hook to facilitate opening of leveler. Your review: The dock Leveler came pack well and was a very easy install. It was well made with heavy gauge steel that will give our customer many years of use. I will purchase this same unit again for our next dock. Bluff® EZ-Pull Mechanical Edge of Dock Leveler 25EP66 66" Usable W 25,000 Lb. Cap. 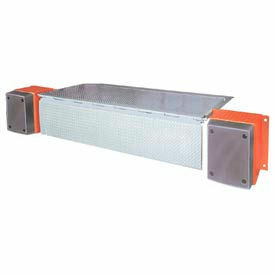 Bluff® EZ-Pull Mechanical Edge of Dock Leveler 30EP66 66" Usable W 30,000 Lb. Cap. Bluff® EZ-Pull Mechanical Edge of Dock Leveler 30EP78 78" Usable W 30,000 Lb. Cap.